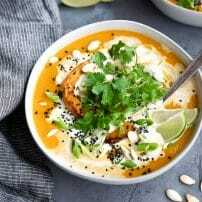 Ready in just 30 minutes, this Pineapple Coconut Thai Fish Curry is rich, comforting, and packed full of chunks of white fish and fresh vegetables. 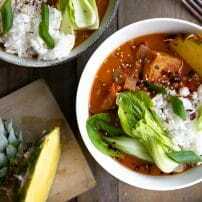 Delicious for dinner or even leftover for lunch, even the kids will love the flavorful broth made even better with sweet pineapple. I feel like I should start this post by explaining that this is not an authentic Thai fish curry. 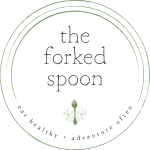 I did not learn how to make this recipe while traveling through Thailand several years ago by a nice old lady like I did Pad Thai (which I will share here one day, promise!). Instead, this is my version of a fast and delicious Thai Fish Curry that literally anyone can make. Because that’s the thing with Thai food- the ingredients are not always so obvious for us westerners. I’m fortunate enough to live in an area where, if absolutely necessary, I can drive to an Asian market for most of those unknowns. But, I know it isn’t that way for all of us. So, here’s the thing. After traveling in Thailand for 6 weeks, and Southeast Asia for 6 months, and having spent more than 7 years trying to recreate some of my favorite Thai dishes, this is what I have learned. Home cooked Thai food will NEVER taste as good as real, authentic, Thai street food. 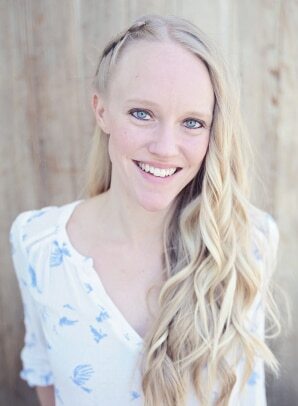 I have come pretty darn close, but I haven’t made it there yet (and I’m ok with that). If I had to pick between Mexican food or Thai food to eat for the rest of my life I would probably pick Thai food. The flavors and spices used in Thai cooking range from incredibly complex to quite simple. The US standard of spicy is weak. Thai people know how to spice their food. Pad Thai, Thai Fish Curry, and Tom Kha Gai (Coconut Chicken Soup) are the most amazing foods on this planet. Along with every other Thai dish. You can make this Thai fish curry with either homemade or store-bought Red Thai Curry Paste. The pros and cons of each are fairly obvious. Store-bought. Buy it and use it at your leisure. Especially convenient if you don’t frequently cook with many Asian spices or ingredients. That said, store-bought Thai curry paste is boring! So totally boring. Homemade Thai Red Curry Paste. Requires quite a few ingredients that you may or may not have heard of before. It also requires a food processor or blender (unless you have serious mortar and pestle skills). More economical overall, as the tiny little store-bought curry paste jars are quite expensive. Oh yes, homemade curry paste also has ALL the flavor. Given the pretty even divide, I have prepared this recipe both ways. Life is busy, so I always keep a jar of the pre-made store-bought stuff in my pantry. However, in a perfect world, I would pre-plan accordingly and only ever use homemade. 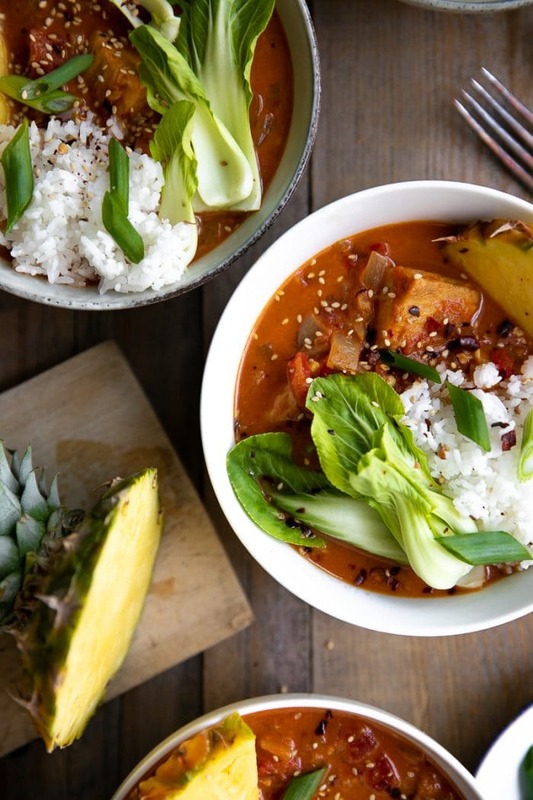 Do you have to use Full-Fat Coconut Milk? Ok, kidding. You don’t have to do anything. However, if you’re asking if it will taste as good with low-fat coconut milk my answer would be NO. A big fat no. Ok, you guys. If there is one takeaway from this whole post let it be this- please, please use full-fat coconut milk. Coconut cream would be even better. But, at the very least, use the full-fat good stuff. Do you think they use low-fat stuff in Thailand? No. never. So, unless you want a watered down curry with a hint of coconut milk, just use the full-fat stuff. Whenever you make any kind of curry with loads of spices it’s best to pick a fish that can withstand prolonged heat and cooking time. 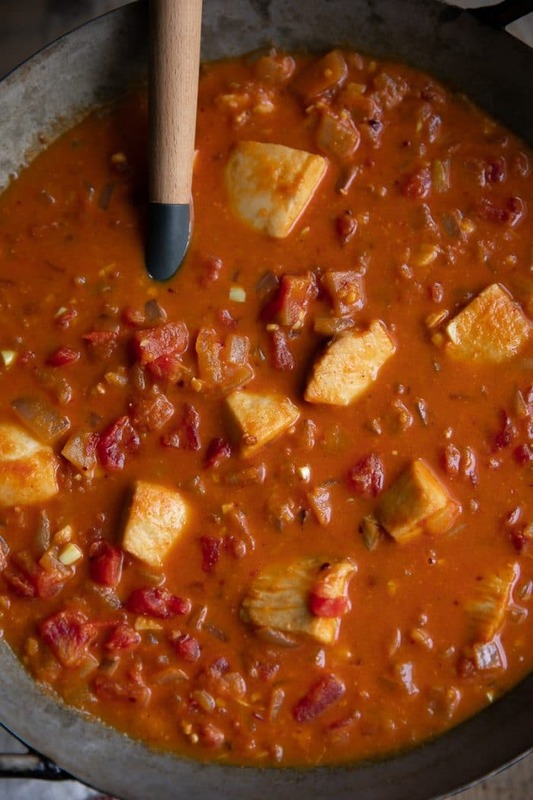 Lucky for us, several different kinds of fish will work in this delicious Thai Red Curry. As always, try to purchase sustainably sourced fish and seafood. Learn more by visiting Monterey Bay Aquarium Seafood Watch. Do you have to add fish? No. If you prefer to add chicken, beef, or tofu, each of those would taste wonderful in this curry. Most often curries, such as this Thai Red Curry with Chicken, are served with a side of white or brown rice and several garnishes. 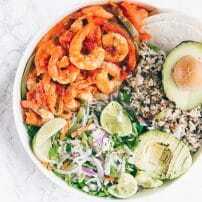 However, that doesn’t mean you can serve this Thai Fish Curry with your favorite rice noodles or, for a more low carb option, zucchini noodles or cauliflower rice. Aside from rice or noodles, I always like to serve my curries with fresh garnishes. 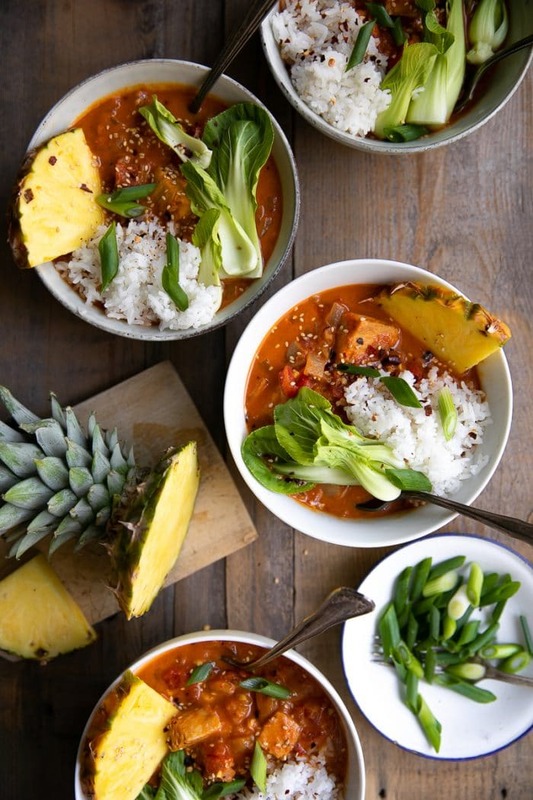 In the case of this Pineapple Coconut Fish Curry I added sesame seeds, green onions (a must! ), baby bok choy (optional), pineapple, and red chili flakes. Other popular garnishes include fresh cilantro and lime wedges. Prepare the ingredients and have them ready to go as this is a relatively fast-cooking recipe. Sauté the onion in a large skillet or wok over medium-high heat until soft and translucent. Cook to soften, not to burn, so make sure you stir frequently. Reduce heat to medium and add the garlic and ginger. Stirring continuously, cook the onions, garlic, and ginger for approximately 30 seconds to 1 minute. Still stirring, add the red curry paste and curry powder. Cook for approximately 1 minute more. Add the tomatoes, red chili flakes, sugar, and salt and bring to a simmer. Finally, stir in the lime juice and coconut milk. Mix well to combine and return to a low simmer. Add the fish pieces, covering the entire surface with sauce. Cover and cook for approximately 10-12 minutes. 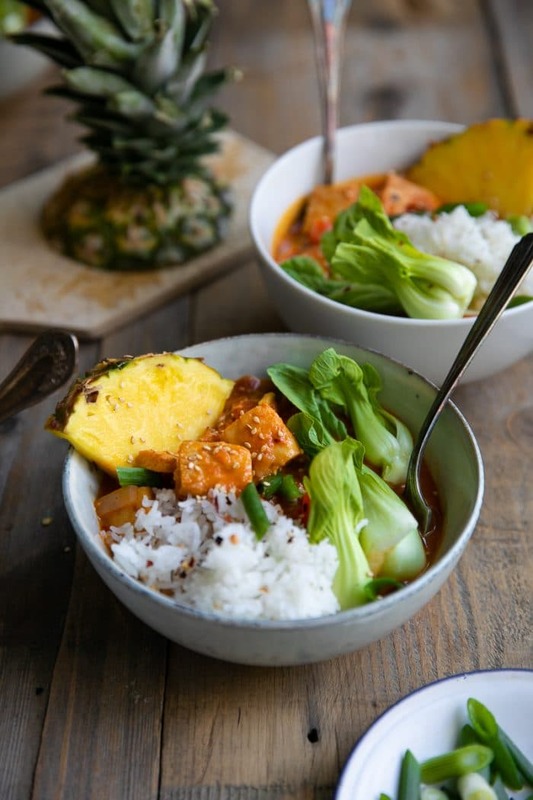 Uncover and mix in the baby bok choy and pineapple. Allow the curry to continue to cook for an additional 3-4 minutes before serving. The leftovers for this easy Thai curry are pretty amazing! The easiest way to store this chicken dish is to keep the Thai fish curry separate from any side or garnish you plan to serve it with. Allow the curry to cool slightly before transferring to tightly sealed containers and placing in the refrigerator. Best if enjoyed within 3-4 days. If you try making this Thai Fish Curry, please leave me a comment and let me know! I always love to hear your thoughts. 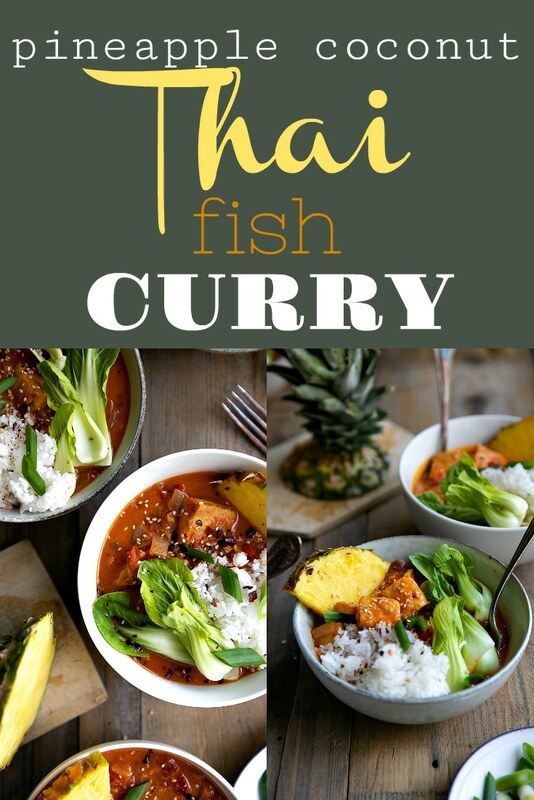 DON’T FORGET TO PIN AND SHARE THIS EASY AND DELICIOUS PINEAPPLE COCONUT THAI FISH CURRY RECIPE AND ADD IT TO YOUR NEXT WEEKLY MEAL PLAN! 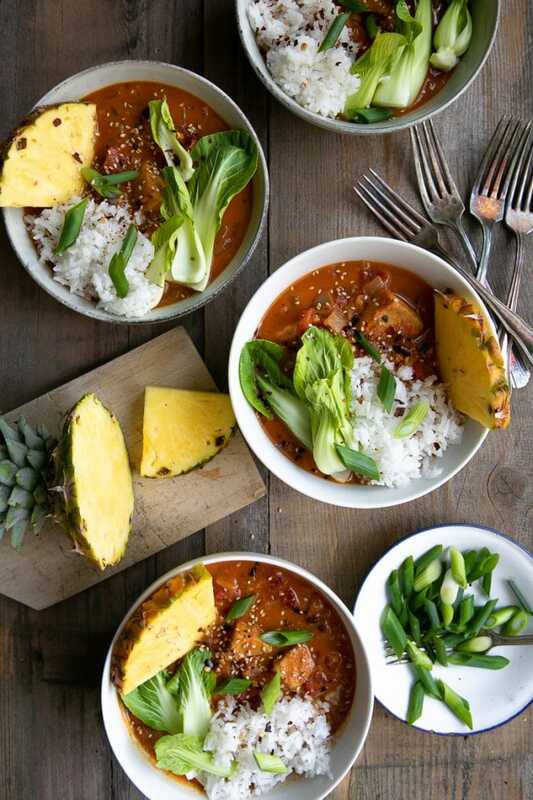 Ready in just 30 minutes, this Pineapple Coconut Thai Fish Curry is rich, comforting, and packed full of chunks of white fish and fresh vegetables. Heat a large heavy bottomed skillet or wok over medium-high heat. Add the coconut oil and onion to the skillet and stir to combine. Sauté onions for 5-6 minutes, or until softened and translucent. Stir frequently. Add the minced garlic and ginger to the onions and sauté for 1 minute, stirring continuously to prevent burning. Reduce heat to medium and stir in the red curry paste and curry powder. Cook, stirring continuously for 1 minute more. Add the diced tomatoes, red chili flakes, granulated sugar, and salt to the onions. Increase heat to high and mix well. Bring the curry to a simmer and reduce heat to low. Add the lime juice and coconut milk, mixing well to combine. Add the white fish pieces in the sauce, making sure they're covered with enough sauce to cook through fully. Cover and cook for approximately 10-12 minutes, stirring gently every 2-3 minutes. 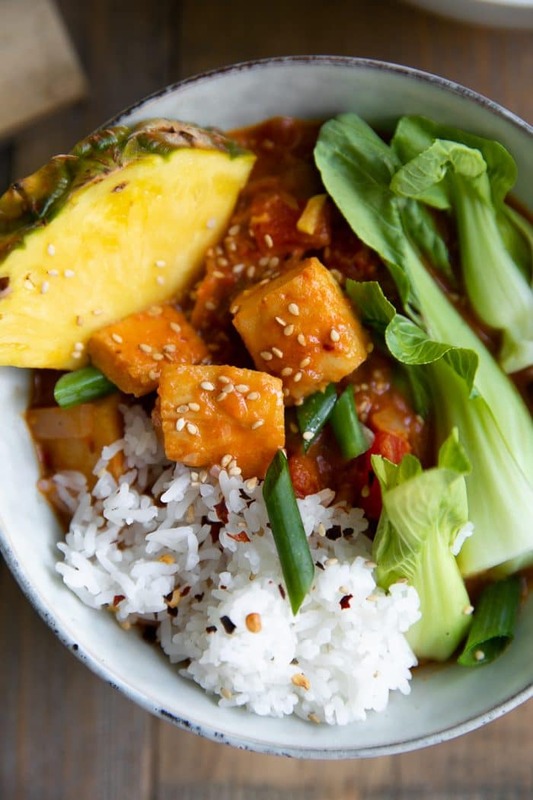 Once fish is fully cooked, add the bok choy and pineapple to the curry and cook for an additional 3-4 minutes. Remove from heat. Serve with rice and garnish with chopped green onion, cilantro, and sesame seeds, if desired. Nutrition facts do not include rice. You can use store-bought Thai red curry paste or make your own. Making your own is quite easy, but you will need a food processor (unless you want to use a mortar and pestle). Find my homemade red curry paste recipe HERE. Low-fat coconut milk is not recommended. Originally published on April 18, 2018. Updated with new text and description on January 25, 2019. 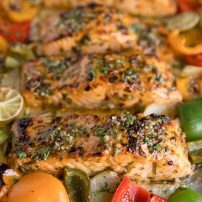 Great recipe, fast easy and verry tasty. 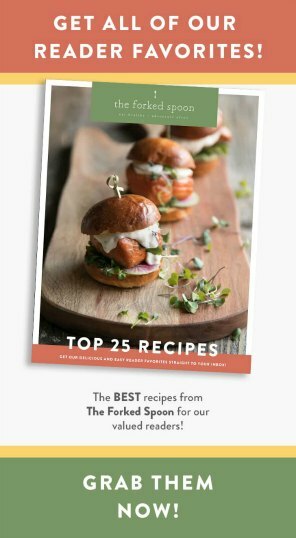 I love both thai and sea foods – I cant wait to try this!